Earlier today, Jessie and I publicly announced the good news that we are expecting our first child this fall. I agree that it won’t be the same. I understand that I will have to make some sacrifices in my schedule. I even realize that there may be some moments when I wish I had the free time of my pre-parenthood life. However, after 30-plus years of being a dependent, I am ready to pay it forward to the next generation. The truth is that Jessie and I have been tremendously blessed in our lives thus far as daughter and son, respectively. Our parents have been and continue to be amazing role models for us, giving selflessly and loving unconditionally. If we can live up to the standards that they’ve set, our child is in good hands. It is in that spirit of love and pre-parenthood hopefulness that I am making a pledge to my future child(ren). It’s idealistic to expect that I can make good on all 30 promises 100 percent of the time, but I’m optimistic that by striving to live up to these promises that I can be the best parent possible. Some of these promises will be easier to keep than others, but I believe it’s part of my calling in life to be a great parent. The key word here is “try.” Right now I have such hope and optimism. I know that in the future there will be down times. I’ll be tired or sick (or both), and my child will want something. I’ll think it can wait, but he or she will think it’s an immediate need, and in that moment (and all the other moments like it), I want to be willing to try to be the perfect dad. Understanding that I will never actually be the perfect dad, I want to be someone who learns from his mistakes. I will make poor choices as a parent. I will lose my temper. I will misjudge a situation. I will let my child down. What I don’t want to do is make a habit out of any poor parental move I make. When I mess up, I want to own up to it, learn from it, and grow as a person and a parent in the future. If I’m not perfect as a father, I certainly can’t expect perfection from you. I will hold you to high standards but not unreasonable standards. When you lose your temper or misjudge a situation or let me down, I want you to know that it’s OK to mess up as long as you own up to it, learn from it, and grow as a person in the future. In life, failure actually is an option. What’s not an option is failing to try or failing to learn from past failures. It’s 2015. You ought to have the right to be who and what you want to be. Insert gender stereotype here: if you choose to defy it, more power to you. I am not going to be the one to slam any doors of opportunity closed. And if you choose a more traditional path, that’s fine, too. The point is that you will have a say in figuring out who you are and what you like from sports to music to theater to art. My job as the parent is to expose you to as many different options as possible and then let you decide what fits you best. I’m a high school English and journalism teacher. I don’t foresee a six-figure salary anytime soon, but I will continue to work hard in my professional career not only for my own personal fulfillment but to ensure that you have the necessities of life and some of the middle class comforts that I have grown accustomed to as well. I think it will be a lot easier for you to maintain healthy eating habits if I help you by modeling them for you from a young age. I have some bad eating habits that I hope not to pass on. I don’t want to fall into a “do as I say and not as I do” mentality because I believe that actions speak louder than words. Setting a good example of healthy eating will go a long way to promoting a healthy lifestyle for you. From lessons in moderation to the kinds of foods we choose to eat as a family, I look forward to making smart, healthy choices about food for myself and for you. In that same line of thought, I know that it’s important to promote an active lifestyle. From family walks in the neighborhood to organized sports, I want to encourage you to be active and exercise regularly. Sometimes I fall into the category of someone who stares at a screen—phone, iPad, computer, TV—for too many hours a day. I am a big fan and avid user of technology, but physical exercise needs to be an important part of your daily routine, too. I want you to know that I am always available to listen. In the early days, I’ll be listening to hear you cry. Later on in life, if you have questions, please don’t hesitate to ask. If there’s something on your mind or on your heart, always know that dad is willing to listen. It’s OK to be scared. Sometimes you have to be brave and face your fears, but other times it’s good to rely on others to help you be brave. If you ever need that someone to lean on, you can count on me. It’s OK to be sad, too. It’s even OK to cry. In fact, one of my favorite quotes ever comes from the late Jim Valvano, former basketball coach of North Carolina State, who said, “If you laugh, you think, and you cry, that’s a full day. That’s a heck of a day. You do that seven days a week, you’re going to have something special.” So if something is tugging at your heartstrings and moving you to tears, let ’em out. I’ll be there to comfort you. Some issues in life shouldn’t have to be taught like the difference between good (Michigan) and evil (Ohio State), but other issues are not as clear. It’s part of a parent’s job to establish a child’s moral compass, to teach them a sense of right and wrong and, eventually, a more fine-tuned shades of gray understanding of more challenging issues. I am a teacher by trade, but teaching as a parent is different. Understand that every lesson I teach is rooted in love, even the lessons that may feel like anything but loving. You won’t like every lesson I teach, and sometimes you might feel like you don’t even like me, but trust me that you will someday have respect for the way you were raised in the same way that I have respect for my parents and the way they raised me. As an educator, I know the value of being a lifelong learner. I also know that a quality education encompasses much more than a letter or number in a gradebook. Academic performance is one component, but I also want to encourage you to develop a strong work ethic and interpersonal communication skills and to get involved in extracurricular activities. I really want to emphasize that idea of being a lifelong learner. Education isn’t something limited to the hours you’re inside of school or doing your homework. As a parent, I want to model how I learn new things all the time and pass on that love of learning to you. I also want to share with you the value of keeping an open mind and allowing that something new that you learn to sometimes override or change your understanding of something that you thought you knew before. There will be times when what I say goes, period. “Because I said so.” Sometimes that’s a lesson you need to learn. See #19 on this list. But as a general rule, I promise to communicate openly. I want to encourage dialogue and explanation. I want you to feel free to ask “Why?” and “Why not?” respectfully when you don’t understand something. Strong communication is at the core of any successful relationship, and I do not think a parent-child should be an exception to that rule. Of course, you will be learning how to communicate, so this process may not always run smoothly, but I want you to learn effective communication skills and strategies and I can’t think of a better way to learn than through your own experience. Sometimes the world makes it seem like it’s not OK to feel anything. Some people can be cruel, and it sometimes seems easiest to avoid ridicule by hiding your emotions, by staying as neutral and unfeeling as possible. I want to model vulnerability to show you that it is OK to be passionate, to be caring, to be vulnerable. It’s OK to feel strongly and to express your feelings. This might be one of the biggest challenges for me personally. I’m pretty sure I’ll be fine if you don’t grow up to play in the NBA or WNBA. Given your parents’ DNA, the deck is stacked against you being especially tall. But what if you choose not to cheer for my teams like the Lakers, Raiders, or Wolverines—am I really going to love you any less? What if you aren’t all that interested in sports at all? No, I don’t think I would love you any less. You’d just be more like your mother, I suppose. And she’s my favorite person in the world! Still, I’d be lying if I said I didn’t have any hopes or dreams for you and our relationship as parent and child. I promise I will not try to mold you into some sort of a mini-me, but hopefully you’ll want to follow in Dad’s footsteps in at least some areas of life. Let’s call a spade a spade: I am not a big fan of dealing with bodily fluids. I don’t like the sight of blood. The worst physical sensation I’ve ever experienced is vomiting all night long from a nasty case of the flu. And I have yet to have the honor of changing a diaper, but suffice it to say it’s not on my personal bucket list. Yet I know that my future is full of encountering unwanted bodily fluids, especially from you: blood and puke and poop, oh my! I have to learn to deal with the messy stuff, and I will. You are worth it. Your dad is a writer. Your mother is a pianist. Your grandparents include artists and musicians. You will be surrounded by creative people, and we will encourage you to find and explore your muse, whatever it is. Be inspired and be inspiring. Creativity is an amazing gift. Don’t let anyone stifle your creativity. One of my fondest memories of childhood is of my dad telling bedtime stories before I went to bed. I am excited to pass on this tradition to you, likely with some help from your mother, who has an imagination that rivals and perhaps even surpasses my own. I think you are in for some awesome bedtime stories! To start, I’ll read to you. Then, once you’re able, I want you to return the favor and read to me. There is joy in reading. Unfortunately, as an English teacher I find all too often that the joy of reading has either been lost or never even existed in the lives of many of my students. I want to actively participate in your development as a reader and help you appreciate all of the possibilities that will be available to you as someone who reads well, reads often, and reads for fun. I am really funny. Don’t ask your mother for confirmation on that one. Just trust me. I anxiously await making you laugh, but probably not as much as I look forward to all of the ways that you will make me smile and laugh. My Twitter profile currently says, “I am a sports fanatic, teacher, writer, listener, husband, brother, son, and more.” I will continue being all of those things after you are born, but I want you to know where fatherhood ranks on the prioritization scale for me: first. Well, maybe it’s tied for first with husband, but I’ll explain that more in item #2 on this list. Even though I’m your dad, I’m still a kid at heart. Although I may have to deal with some grown-up aches and pains, I cannot wait to play with you. Someday when you’re older, you’ll realize that one of the toughest things about growing up and becoming an adult is losing out on playtime. First they take away recess. Then before you know it most of your free time is occupied by being responsible. So whether we’re outside running around together or inside hanging out playing with your toys, I am likely almost as excited as you for playtime. God is good. You don’t have to look beyond a mirror to realize that. Your mother and I are so blessed to have each other and now to have you. It’s important to give thanks for all that we have, and I want you to feel comfortable praying from an early age. You represent a new chapter in our development as a family. How will we celebrate your birthday each year? What will Christmas look like? Easter? Thanksgiving? As the family grows, traditions that I grew up with will change and we will form new traditions. I know how meaningful those memories were and are to me, so I want to ensure that you are a part of something just as special. I have hinted at this throughout the list, but I really want to pass on the legacy of my parents/your grandparents. Many of the items on this list are inspired by them already, but I wanted to call them out specifically. Trust me when I say that if I treat you as well as they treated me you are in for a great life! Both sets of your grandparents are the coolest, and they live in Erie, so I know they will be around often. Additionally, you have some amazing aunts and uncles to get to know. Some are in town and others might have to check in via FaceTime or Skype more often, but they are all dying to meet you, and welcome you into the world, and shower you with love. You also have two great-grandmothers and so many other extended family members—not to mention all the family members looking down from heaven—who love you already. Truthfully, this promise works in concert with the other 29 items on this list because I am not entering this new world of parenthood alone. Fortunately, I am entering with the greatest tag team partner I could ever ask for. Your mother is already loving you on a daily basis as you grow and develop inside her. I have known her for more than a decade, so trust me when I tell you that your mother knows best and will love you more powerfully than you could even imagine. Together, she and I will work together to give you the best life possible. I cannot think of a more powerful promise than this one. Yet somehow from the first moment I knew you existed, I was compelled to feel this way. I love you so much already, and not a day goes by that I don’t think about you and all the joy that you will bring into this world. My parents gave me the gift of unconditional love, and for so many years of my life, I was overwhelmed and in awe of that love. I worried, thinking that I could never repay them for that gift. But I am starting to understand that I was never meant to repay them for that gift. Their love did not come with stipulations, limitations, or provisions. Their gift of love was not a debt to be repaid. It was meant to show me how to love you. I do. And I always will. In honor of me turning 30, I made mix CDs of my favorite songs from each of my 30 favorite musical artists/groups. Read the introductory post for more background information on my 30 at 30 project. Reminder: there is no scientific rationale for this list. They’re simply my personal favorites. Coming in at number 6 is Ben Folds. Depending on your age, you might know Ben Folds as the sarcastic and sometimes sophomoric frontman of 90s alt-rock band Ben Folds Five or as the bespectacled, dorky dad who critiques people’s singing on NBC’s The Sing-Off. Somewhere between those two benchmarks Folds became one of the most influential musicians in my life. Like most people my age, my introduction to Folds came in the form of the 1997 Ben Folds Five hit “Brick.” However, it wasn’t until I listened to songs from 2001’s Rockin’ the Suburbs, specifically versions played on a piano in a Mercyhurst College practice room by a young Jessie Badach on a spring evening in 2005, that I became a full-fledged Folds fan. 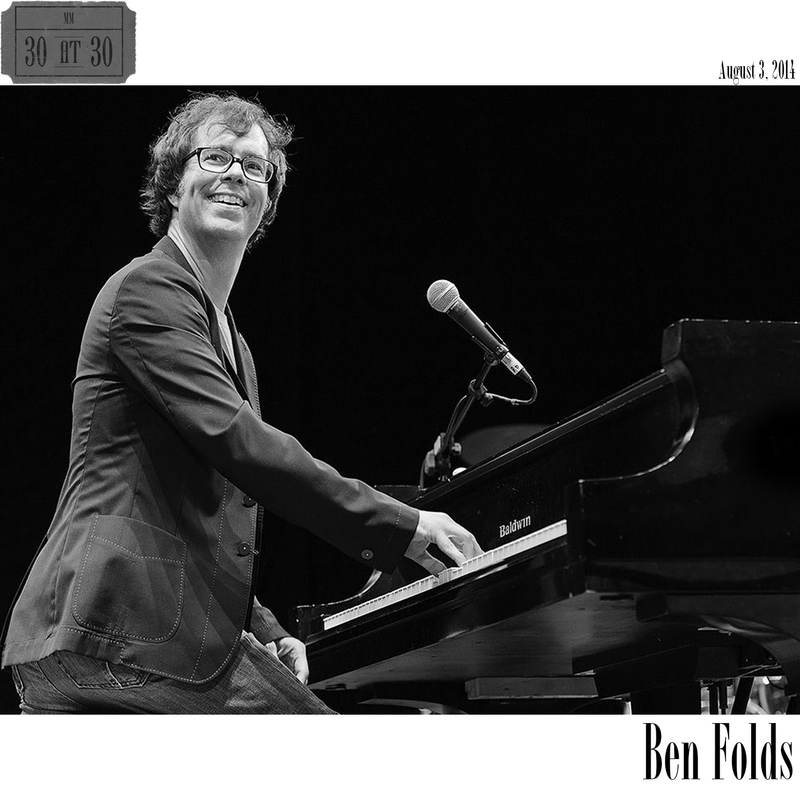 After that night with Jessie, I began catching up on everything in Folds’ discography, including the fabulous Ben Folds Live album he released in 2002. Upon listening through that album many times, it was undeniable. I had to see Ben Folds live in concert. Correction: I had to see Ben Folds live in concert with Jessie. As luck would have it, Folds was coming to the Promowest Pavilion in Columbus, Ohio, later that summer. As soon as that tour date was announced, I purchased the tickets online. However, I failed to account for one minor detail. Jessie’s parents were not too keen on the idea of their fresh-out-of-high-school, 17-year-old daughter traveling across state lines to see a concert with a college boy. In hindsight, I totally understand their skepticism, but at the time I was devastated. But I’m one of the good ones, I thought to myself. If they actually knew me, they wouldn’t hesitate to trust me, I reasoned. Looking back with my current day wisdom, I can see the fault in my argument, but back then at 20 years old I was nearly inconsolable. Rather than find another friend to attend the concert with me, I protested and stayed home. I still have the ticket to this day! Fortunately, the story has a happy ending. Less than three months after the concert that wasn’t for Jessie and me, Ben Folds headlined a show at Allegheny College, where Jessie was a freshman. As a birthday gift, Jessie got me a ticket, and we were the first people in line for the show, which earned us a front row spot for the concert. As expected, my appreciation for Folds’ music only grew after seeing him perform live.